It only took me like a year to realize there was a way to adjust the white balance on the video settings for my camera. Not bad. I knew about this adjustment for still photos, but until recently never figured it out for video. I was testing my new found skills on a recent late night snack, and when I was done I realized I had a halfway decent video recipe to post. The color still isn’t great, and I'll continue to practice and adjust, but it's much better than the yellow-orange cast I used to suffer with. 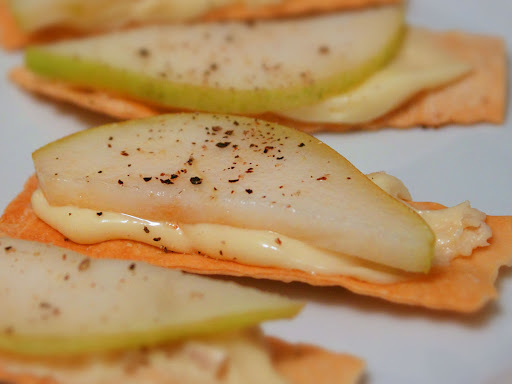 This simple and delicious ripe brie and pear appetizer is inspired by one of my favorite meatless sandwiches. A couple times a year, I like to take a warm piece of crusty French baguette (now that's redundant! ), spread it with a little butter, add some soft, very ripe brie cheese, and a few slices of juicy, equally ripe pear. This masterpiece of French engineering is finished with a few turns of freshly ground black pepper, and eaten in close proximity to a glass of red wine; truly one of life's great culinary pleasures. Here we've taken the same idea and turned it into a very quick appetizer that will work nicely when the occasion calls for something a bit more sophisticated than beer and pretzels. Enjoy! What kind of camera do you use? Your video always look amazing! When my daughter was in Strasbourg for a semester, it always floored her that the French tossed away the inner part of the baguette, using only the crust, for the most part. And always with butter - "because the bread is dry". Um, okay? The pear tree in the yard is just out of bloom. Later this year, the Wine Snob friends will be coming over - and I'll be ready for 'em!! Thanks! Glad to help! btw, that resto rec for Rochester looked great! OMG, that looks so-o-o-o frickin' wonderful. This will happen at my house just as soon as I find some nice fresh ripe pears and some new friends. Kidding about the new friends--my friends are simply the best. What do you recommend for wine? Maybe a chenin blanc or a pinot noir? PS Oh, yeah. About that sandwich cutting technique? Do movie editing programs have similar filters as image editing programs? Could you someone apply 3-5% blue over your orange'ish movies. With plain images, I found it easier to use a different layer, then fiddle with that layer's transparency setting. But if layers aren't an option, there was always the undo button until you get the color correction you like. Hi Chef John, do you have a tungsten setting on your camera? Most of the light bulbs in American homes are tungsten and my digital camera comes with a tungsten setting as well as fluorescent. The settings will apply an appropriate amount of color correction automatically that may be sufficient for your needs. Of course editing programs will clean up your images further but the raw video will be very nice to start with. Just don't forget to set the tungsten or the fluorescent setting back to normal lighting or everything will be Ompa Lumpa orange or Smurf blue. Keep up the good work. Having to eat saturated fat free for the last few months has made ingredient selection tough. One discovery I stumbled upon is that dried, sweetened cranberries make just about anything taste better (chicken, turkey, fish, beef, pork, etc.) At first I was using dried cherries but soon found that dried cranberries taste much the same when used in a dish rather than just eaten alone; it also helps that they cost 1/3 as much as dried cherries. The biggest surprise, though, came through a complete gastronomic accident (i.e. laziness). I normally load up a turkey sandwich with tons of cheese but unfortunately this habit has become verboten. Instead, I came up with the brilliant idea of using low-fat mayonnaise with dried cranberries in it to add some texture and bright flavor to the turkey. Without thinking, I started grinding on the black pepper like I normally do when using cheese. Since it was too late to do anything about it (i.e. I was too lazy to clean the pepper off) I forged ahead and ate the sandwich with the cranberries, mayo and black pepper with the full understanding that the gag reflex might kick in at any time. BUT, to my amazement, the black pepper enhanced the flavor of the cranberries and really brought out the various flavors in the sandwich. Since then, I've really started to use fruit as a flavor enhancer in all kinds of dishes (as you've done here) and have added black pepper to each one. It really is a surprising and delicious find. bdwilcox: But how did you CUT the sandwich without the "cutting sandwiches demo" from Chef John? I'm thinking that was simply a cruel joke. I agree about the pepper.. its a bit unusual but I like it. I like to sprinkle coarse garlic powder, pepper and cayenne on my popcorn (along with the salt and butter.) Sounds strange but it works nice, IMHO. I'm going to try it during the week-end. I usually make toasted tuscany bread on top brie, pear & honey. I adore your stews. For those of us who are Paleo eaters (no grains no cane sugar) would you agree that instead of a cracker, a slice of zuchinni would do?